STEM means Science, Technology, Engineering and Math (as we all know, of course! ), and while the S, T, and M are quite self-explanatory, I’m often asked what exactly kids do in our Engineering programs. It’s a great question! 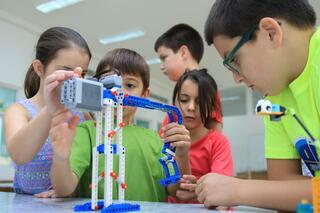 Kids do science, maths, and even technology at school so those are familiar to us – but what about engineering? In a nutshell, engineering is integrated in every aspect of our daily lives, because it means the science of designing, making and building things. So, how can it help your children at school? In what way is Engineering fun for kids? What is it that makes kids enjoy the engineering programmes so much, you might ask. Well, if I had to pinpoint one or two reasons, I would say it is the fact that the activities are very practical. This means that they are realistic and link to real-life, tangible projects; and secondly because the activities are very hands-on and appeal to children’s innate desire for experiential learning (learning by doing). This helps learners build valuable knowledge and develop their understanding of the world around them and how it works. Yes, it is possible to fill children’s heads with ‘empty’ knowledge and formula, and even to have them ace an exam with it, but what do they really know? How much better to have experienced and experimented with constructing something to understand the concepts of stability, weight, and gravity – to actually see it in action! With that deeper knowledge, individuals can identify patterns and apply the knowledge to other areas. This is how STEM for Kids Engineering programmes help your kids, not only do better in maths and science at school, but also to enjoy it more and to think critically and creatively about the concepts they encounter in the school curriculum. So, let your children improve their prospects at school and enrol them in an 'Experience Engineering' course where they will have fun learning all about Mechanical, Civil, Aerospace, and Environmental Engineering. And maybe they'll teach you a thing a two!